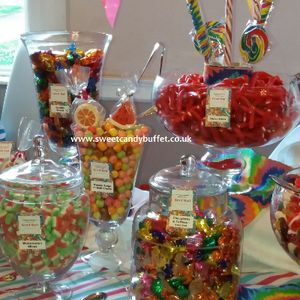 Sweets & Candy Buffets supplied parties of 50 to 3000. INCLUDES:- 1) 20 varieties (Min) of sweets & chocolates, including premium lines - choose from over 100 or we can do that for you. * Larger parties will have many more varieties and lots more vessels to display them in. For example, Tables up to 30' long with approx 50 varieties for a party of 3000 guests 2) 200 grams per guest (2 sweet bags each) - You choose how many guests you would like to cater for - 100% / 75% / 50% - whatever you think best. 3) A minimum of 20 gorgeous vessels for your display - Stunning glassware, silverware, Crystalware, China - Tiered stands, pedestal stands & bowls, Bon Bon jars, Apothecary jars, Vintage sweet jars. 4) Fresh sweets every time. Leftover sweets are wrapped for you to take away. 5) 2 hrs attended service - more on request. All day unattended buffet available if you prefer. 6) Fully customised decorated table in your colour/s - Themes catered for. 7) Colour themed sweets displays available. 8) Special dietary needs catered for - Vegan, vegetarian, gluten free all at no extra cost - Sugar free and Halal varieties, price on application. PRICES:- 50 Guests = £290 75 guests = £320 100 guests = £350 125 guests = £380 150 guests = £410 200 guests = £475 Please ask for a quote for larger parties. 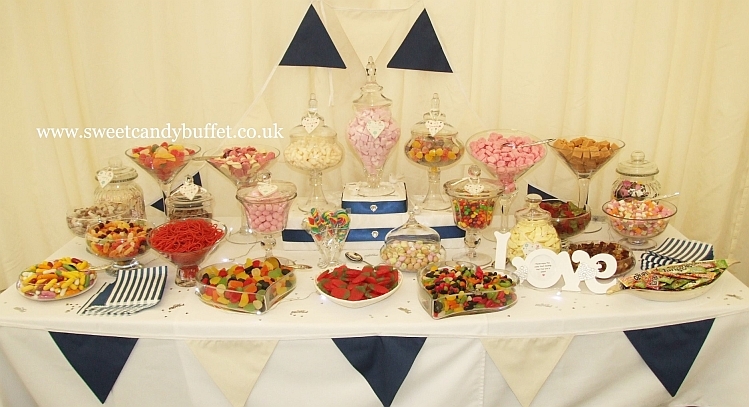 This is NO small sweets candy cart - This is a luxury bespoke service offering stunning & elegant sweets & candy buffet banquet tables for any occasion. We have over 9 years experience successfully supplying many parties from 50 guests up to 3000 guests and are pleased to have many returning customers. Average 1.5 to 2 hrs for up to 200 guests. Tables for 3000 will take approx 6 hrs. Lots of Pick & Mix sweets PLUS chocolates and premium lines like: Curly Wurly, Dip Dab, Mini eggs, Skittles, Swizzel mix, Popping candy, Sherbet fountains, Refresher bar, Wham bar, Ferrero Rocher, Milk Tray, Celebrations, Roses, Quality street, Millions, Chocolate eclairs, Chocolate honeycomb & cinder toffee, Chocolate raisins, Candy necklace / whistle / lipstick, Flumps, Drumstick lolly, Double lolly, Swirl lollies, Marshmallows and more. Over 100 sweets & chocolates varieties to choose from and special requests catered for. Sort of :-) We offer a large (3' diametre) 3 tier centrepiece decorated in your colours, holding exquisite crystal and real silver dishes full of your sweets choices, as part of your display. Some guests have even asked us if it is a real cake! Lots of Pick & Mix sweets PLUS chocolates and premium lines like: Curly Wurly, Dip Dab, Mini eggs, Skittles, Swizzel mix, Popping candy, Sherbet fountains, Refresher bar, Wham bar, Ferrero Rocher, Milk Tray, Celebrations, Roses, Quality street, Millions, Candy necklace / whistle / lipstick, Flumps, Drumstick lolly, Double lolly, Swirl lollies, Marshmallows and more. 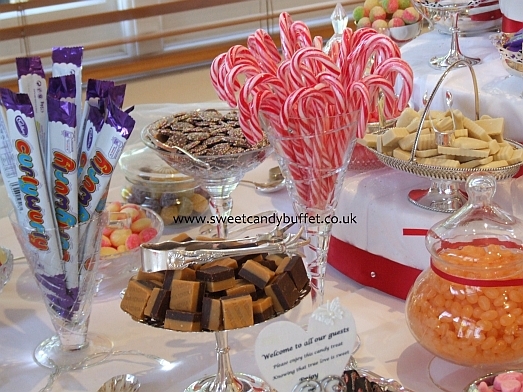 Sweets and candy buffet banquet table hire with 20 or more varieties for you to choose from a list of over 100. Chocolates & premium lines included. Sweets & candy banquet tables with 20 or more varieties of sweets including chocolates and premium lines.